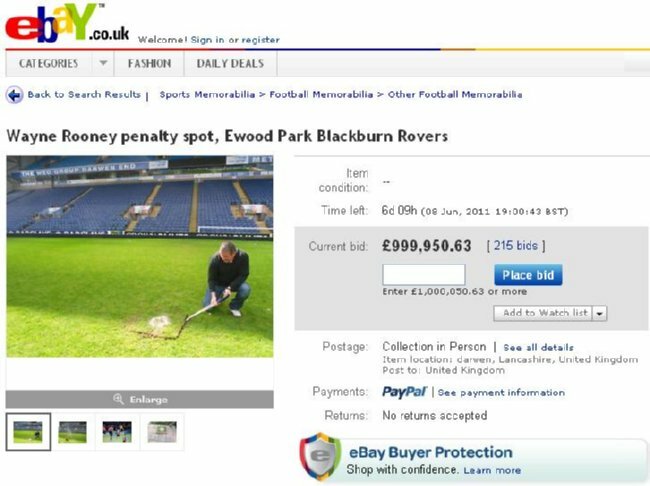 Fancy snagging yourself the very square of Ewood Park turf that Wayne Rooney wrapped up Manchester United’s 19th league title from? The perfect piece of unique sporting memorabilia, if you also happen to be uber-rich and uber-mental. Got a cool million to spare? Fancy a flutter? Then step this way. Looks like there were a lot of fake bids as its down under £200k now. So what about the shirt he scored in, the ball, the net, the keeper’s gloves, his boot… etc. Don’t see why a lump of soil that’s going to decay is so special. id be surprised if the turf fetched more than £10!!!! Can the turf be verified as genuine also? could just be a square of grass with a white spot painted on it from someones back garden!! hahahahaha! !